In this article, I will be shortlisting and be reviewing all the best kitchen hobs in India. These products are also called built-in hobs, gas hobs or hobtops. A hob is a modern variation of the gas stove. Most hobs are installed on your kitchen top and cannot be removed easily. Hobs are also comparatively expensive. So it is really important that you make the right choice while you are buying it. I went through all the gas hobs that you can buy online and have shortlisted a list of 7 best kitchen hobs that you can consider buying. If you are looking the best option out there right now, my personal suggestion would be to buy this Elica Brass 4 Burner Hob. Also, do not forget to read about why I don’t recommend buying the Prestige hob top in the latter half of the review. So, I will start off with the list below. This is the most elegantly & intelligently designed kitchen hob on the list. And there is no surprise that this is also one of my most preferred gas hob on the list. There are two variations available in the same product. There is a hob with 4 & 5 burners. You can go for the one that fits your requirements. Both models have a tempered glass, which is easier to clean and does not break easily. You can easily use an Indian vessel on it (Curved bottom) – It is not necessary for you to use flat bottom utensils. However, if you are shifting from a cooktop for the first time, you will need some time to get used to this product completely. The quality of the product is top notch. The product has a beautiful black finish. The buttons are very sturdy and easy to use. Overall a 5 star rated product from Bosch. Both models have auto-ignition. In case there is no electricity at home, you can use your regular lighter. The burners are made out of Aluminium. This is the only drawback of what is a fantastic product otherwise. If brass burners are must for you, you can for the Elica Hob featured below as number 2 product on this list. The 4 burner hob has 2 Standard burners, 1 Economy and 1 Wok(4.0 kW). While the 5 Gas Burner model has 1 Rapid Burner, 2 Standard burners, 1 Economy and 1 Wok(4.0 kW) burner attached. Elica is a very well know brand for their kitchen chimneys and hobs. They have some of the most silent kitchen chimneys in India. Their kitchen hobs are equally good and well designed. Have a look at the images below to see two of the models I would be discussing. The two models are almost the same. There is one small difference between the two. The classic MFC 4B 60 Model (Fully black hob in the picture below) has one larger burner of 4.0 KW, one medium 2.5 kW and 2 small 1.5 kW burners. While the Classic Brass 4B (The picture on right with silver between the burners) has one medium 2.5 kW and 3 small 1.5 kW burners. There is one major advantage of this product. and hence it picked up the number two spot on the list. This can produce can be used as a built-in hob or a freestanding cooktop as well. This gives you added flexibility. This one of the best built-in hobs with brass burners in India. The brass burners are further coated in black enamelling to prolong their life. This one more kitchen hub with brass burner. There is no coating on top so the brass is clearly visible on the burners. The hob is nicely designed and has ample space for you to cook on 2 or three burners at one go. The hob has an electric ignition system & works fine with regular lighters too. This product has 2 years of warranty with onsite support for any manufacturing defect. This kitchen hob has a unique design. Any normal Indian household will be cooking using a medium to large utensils. The problem with most of the hobs is that you can fit multiple utensils in one go. This unique design helps solve that problem. You can use the burner on the right to cook with your larger cooker or kadhai, while the smaller two can go on the left. The burners are made out of aluminium. The top has a nice black finish to it. The glass used is a toughened glass to make the surface more sturdy and scratch resistant. The burner style is Italian double ring. The gas hob has 2 big burners and one small sized burner in the front. The product looks really good. They only thing I wish was better, were the knobs. I am more comfortable using the regular gas knobs, while this kitchen hob has round knobs. One more hob from Elica which also can be used as a cooktop. So you have an option of getting it fitted inside your platform or just use it as a free standing stove. The design of the product is quite sleek and modern looking. The support for the utensils is made using cast iron and hold regular Indian utensils (Curved bottom). The product comes with two mini triple ring brass burners and one larger double ring brass burner. The knobs again are circular, however, the quality of the knobs is good. This is an amazing looking product from Glen. Unlike the products from Elica, you cannot use this product as a regular cooktop. You will need to have it installed on your platform. The burners are made using brass and are long-lasting. The thickness of the glass used is 8mm. The product comes with a one year warranty. There is also installation support provided by Glen team. You can also get it installed by your own vendor. Why not buy Prestige HobTops in India? Even though Prestige is a very know brand for kitchen appliance and cookware, I will not suggest you buy a Hob from them. The brand is known for its quality and price effectiveness (Compared to premium brands). However, it seems they are yet to crack the right formula for Kitchen hobs. The product does not work really well and the most difficult bit is the knobs. The knobs simply don’t work as expected and are not well made. Don’t believe me? Read these user reviews here & here. Knowing the brand, I am sure they will be launching better models soon. What are the factors to consider before buying a Kitchen Hob? The depth of the Burner stand: Ensure that they hob that you buy is designed for Indian cooking. Else you will have to replace your utensils (with flat bottoms) or buy extra supports. Keep aside extra money for installation. Hob is generally installed on your platform, while traditional gas stoves are kept on top. The stoves are movable, while hobs are permanent fixtures. You need to get the hobs installed. While stoves are ready to be used. Regular gas stoves are portable and hence are easier to shift. Hobs generally look much better and are easier to clean. The flow with your platform giving your kitchen a much more modern look. Hobs tend to save space and are ideal for small kitchens. Which is better, Gas Stove or Hob? Are you buying this product for your own home? Do you plan to stay in this home for years to come? You don’t plan to make any changes to the position of your hob once it is installed? If answers to all the questions above are yes then you should probably go with Hob. However, if you are staying in a rented space or if you plan to shift your home soon, I will suggest you save money and buy a gas stove. Use my guide on the best Gas Stoves in India to buy the right one for your kitchen. Brass vs Aluminium Burners – Which one to choose? Brass Burners – Brass is an alloy made by mixing copper and zinc. The most beneficial characteristic of brass is that it does not rust. This metal is also very durable. These properties make it an ideal choice for the gas burner. Burners made out of brass will tend to serve you for a long period of time. Aluminium Burners – The melting point of pure aluminium is lower compared to brass. This means that it will deform faster (Although this burner will also serve you for multiple years). The advantage of aluminium is that it is cheaper compared to brass and second, it cools down much faster compared to brass (Makes cleaning the gas hob easier). It also makes it safer if you have kids around your house. If your burner does develop any problems, you should be able to easily replace the same if you have a hob from a reputable brand. The most important disadvantage is that it is not portable. If you are a bachelor or staying in a rented space, you should consider a freestanding cooktop. They need installation and a major one. You will need to make space inside your platform to have it fitted. The need for either electricity or a battery(depending on the model) to operate the auto ignite feature. But this is not a major drawback as you can always use your regular lighter to turn the flame on. Replacement or repairs are a bit complex since they are fixed. This brings me to an end to my review on the Best Kitchen Hobs in India. I hope you were able to make a decision on the right hob for your kitchen. Do share your feedback, queries or suggestions in the comments section below. Can we use Bosch as free standing or it should be built in? Customer service is experience is very very bad. Then how you can suggest this. Most of their models have either 4 or 3 and a half stars on Amazon (At the time of writing this comment). As you rightly pointed out, a few people do face issues with the support. However, if you look at all the products available on the market, the quality of their product is better. So even if I assume you face issues with installation, the product should last you for years and compensate for a couple of days of inconvenience you faced in the beginning. I hope this helps. Hi, your reviews are limited to glass top hobs. Can you share recommendations on stainless steel hobs suitable for Indian cooking. I did not include steel hobs since I personally find them a bit more difficult to clean compared to the glass ones. However, if you wish to go for them, you can consider this product by Bosch (The link takes you to Amazon India). Steel hobs are certainly more durable and give a more traditional & classy look to your kitchen. 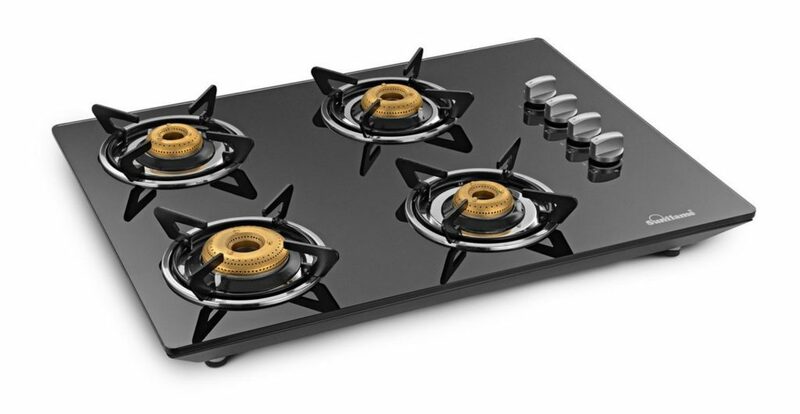 Bosch has recently introduced their 3 burner (brass) range. Any reviews about that? I am happy you found this article useful. I haven’t seen or tried the 3 burner brass hob from Bosch, so it will not be right on my part to comment on the same. If you can share the URL of the product you are referring to, I can try and get some feedback about the same. Sorry for the late reply. Here’s the link to the hob that i was mentioning. It comes with tempered glass top with 3 brass burners. Please let me know your thoughts on this. There are specific models available which can be used as both hobs as well as the gas stove. Most regular hobs cannot be used as a gas stove as they won’t be stable and are designed to be used that way. It is not safe to use a regular hob as a gas stove. How about Siemens hobs? Any reviews about it? Bosch & Siemens are both similar in quality and features. You can safely opt for them. However, I would still prefer Bosch since they would have a more established customer support. Very nice comprehensive review & buying guide. What is your opinion on Faber hobs ? Their chimneys top the list, but I find Faber hobs are not on the preferred list. But I know for a fact that their after sales service is one of the best since we have been using Faber chimney & hob for last 18 years. Being old models they did require regular Faber service. Of course as you have already hinted in case of Elica, where quality / reliability is good, after sales service would rarely be required. We are intending to purchase a hob & chimney, total budget about 35k for both, & appreciate your feedback. Thanks. Thank you for your kind words and apologize for the delay in response. I have found that service quality of brands varies a lot in different areas/cities. So my choices on this list are based on overall experience across India, the build quality of the product, features offered for a particular price point. If you find that Faber offers a good service and you are happy with their products, you certainly opt for them. I am not a big fan of being brand loyal. I always recommend you should opt products that will serve you well and not the other way round. I am looking to set up my new kitchen and I am not able to make up my mind between a traditional cook top stove and an in-built gas hob. I note you have highlighted the pros and cons here but since I have a small kitchen is investing in a in-built gas hob a better idea? Also, do you have any tips for choosing between an in-built oven versus a normal OTG. Since I am getting a modular kitchen designed (which will have a tall unit that houses an oven), the temptation is obviously to go for an in-built oven. Any suggestions would be helpful. I would suggest opting for an in-built hob that fits well in your kitchen. If a 4 burner does not fit well, opt for smaller 2 or 3 burner hobs. For OTG, again an inbuilt one is a better choice for regular kitchens. However, as you said you have a small kitchen, you wish to opt for a normal OTG. This will give you the flexibility to keep it aside on normal days when you don’t plan to bake, this will free up some space in your kitchen. You can also utilize the space otherwise reserved for your in-built OTG as a storage space. Hi. Nice and crisp review. We r in to process of buying a hob for our new modular kitchen. We hv finalised Bosch make builtin oven, microwave and chimney for our kitchen. I liked the Bosch 5 burner hob top as u mentioned above but my only major concern is that it is with Italian burners which I believe not suitable for Indian cooking and comparatively very slow for cooking. I saw there brass burner range of Bosch which I liked but it comes only in 3 burners. I need your opinion on my concern and suggestions. Your prompt reply is appreciated. Yes, you are right. The Italian burners do give out low flame compared to regular gas stoves that we use in India. However, you tend to get used to it in a few months time. Most good Inbuilt hobs would have this problem. If I was in your position, I would surely go for the 5 burner gas stove since it would be a good option for the long run. All the best with your new kitchen. I am sure it will turn out really good. It takes more time to cook food, if there is a spillage then the burner doesn’t work till a good 4 hrs. There is no multi flame control…either it is too high or too low. Horrible for round bottom utensils and takes cinsiderable time with flat bottomed ones. I am contemplating to fill the granite cavity and buy a decent gas stove OR change the hob. So just wanted to reconfirm that do any of the hobs cook indian food easily and r easy to maintain like our good old indian gas stoves? The hobs that you have to shortlisted are they suitable for indian cooking with all kinds of utensils and do they have multi flame control like gas stoves? P.S. this is my 1st hob gas…. have always used gas stoves. Sorry to hear your experience. As I have said earlier. It does take time to move to a gas hob. The flame provides by gas stoves is normally high compared to the way hob burners are designed. 1. You have the flame of the hob adjusted. Either call the company representative(I know this can be difficult) or spend a few hundred bucks and get a local technician (Trained and good one). Ask him to increase the gas intake, this will increase the flame output. 2. You can check if there are any impurities stuck in the intake pipe. Watch the video below to see how you can clean it at home. 3. Give yourself a couple of months to adjust to the new hob. It took me some time but I am really glad I tried. 4. Multi-flame – Most hobs give you the option to have a range of heat settings. I am not sure what model of hob you are using. Again, check with the technician to see if your gas intake is too low. Maybe increase it will fix the issue. I would suggest Gas stove, I have been using Faber hob for the past 5 years but the wastage is too much as the flames are spread out and take a long time to cook with lots of gas wastage. Had to bear up as needed to change the whole platform another expense, in gas stove the flames are upright and cooking is faster and cheaper. I used to use a cylinder for a family of four for 2&1/2 months on gas stove while my gas cylinders only lasted for a month on hob. Shifted back to gas top after changing the entire platform now. Using hob the worst decision of my life. You can refer to the recommendations above. Bosch can be a really good option for you. your review is really helpful to new buyers. On shop, Bosch looks premium with its jet black design (4 burners). i wanted to have one very small burner which bosch have it in bottom right corner with front knob model. But dilematic with slow cooking and aluminum burners. on a case study basis, how much time delay will be there between brass (Elica) and Aluminum (Bosch) burners? Are you referring to this product? If so, sorry I won’t be able to comment on the same since I have not tested/viewed it closely myself. Your article for deciding the best hob is good, I would like to know how are Kaff built in hobs. In addition to my previous query I would like to know if in 2019 any changes to the list if best built in hobs. It would help to mention a date in your article. Hi, Nice review… but i was surprised that, you have missed one more famous brand KAFF which have many varient in the market. Kindly leave ur comments. You are correct in your observations. I am still testing a few of these models out. I am also planning to feedback from some actual users before amending this list. Hi, fabulous respond and waiting for that…. What is the difference between Hob and gas stove. Want to know both are operated by LPG cylinder? Has I am shifting my house and it is permanent home, I would be doing modular kitchen so which is the best hob or gas stove. I have never used hob. Also I don’t have budget more than 7000/- suggest me hob or gas stove. If gas stove which is the best gas stove company has u suggest for hob. The main difference is that Hob is fitted inside your kitchen platform. You will need to spend extra to get the platform cut and then hob installed onto it. While the regular gas stove has no such requirements. If you have a tight budget, I suggest going for a gas stove for now. You can consider buying this gas stove by Elica. If you wish to save some more money, you can opt for the three burner model as well.